Was Baal ever a sun deity? I’ve heard from various sources, all of them likely Christian, that Baal was linked to sun worship (then again some of those some sources claim Baal and Nimrod are the same entity). Aside from that, I’ve found no evidence that Baal was ever a sun god. 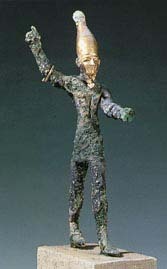 And keep in mind, in ancient Canaan, Baal was often worshiped in the form of many deities bearing the title Baal, though we was still often thought of as the great and mighty fertility deity (though to be fair, this might have been to do with the fact that only priests were allowed to utter the name Hadad; and it’s possible Baal became a distinct deity later). There’s also Bel from Mesopotamia (not to be confused with the Celtic Bel, or Belenus), who was also believed to have been a sun deity, though I have heard nothing linking Bel to the sun. Bel was associated with Marduk, who was not a solar deity. There’s a deity called Malakbel who is a sun deity, but that is a separate deity that has Bel as part of its name. My only theory is that Baal became identified with the sun at a much later point, or that Baal’s association with the sun is merely from a Jewish or Christian point of view. Or perhaps, it might just be another wacky conspiracy theory invention.